Right after the new year, I headed back to Denver, the home of Craftsy, to shoot another class for this fun, dynamic platform for those who love to get creative with anything from cake decorating to quilting. And cooking is certainly a most delicious way to get creative! This new class reflects my lifelong love of all things salty — the focus of the lessons in Homemade Salty Snacks (this link includes a $10 rebate! ), an exploration in going DIY with that popular category of food, allowing you to customize to suit your own taste and maybe skip that snack aisle at the grocery store now and then. I had really enjoyed shooting my first Craftsy class, French Home Cooking Essential Techniques, that’s an arena that I adore as well. But shooting this new class was even more fun because, in part, I’m so enthusiastic about how wide a world of possibilities is opened up with a handful of basic techniques and core recipes. 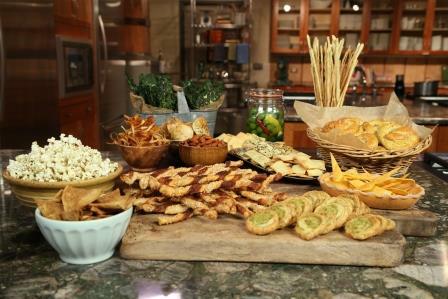 The 2 1/2-plus hours of instruction in the class cover some of the quickest and easiest of snack options, including seasoned popcorn, spiced nuts and quick embellishment of that freezer-section staple, puff pastry. Making crackers at home might seem daunting, but I show a very easy recipe that’s about as easy as making cookies: stir ingredients in a bowl, roll out the dough, cut and bake. If you’re up for something a bit more elaborate, I’ve got that too with homemade soft pretzels which do take a bit of time, but with detailed step-by-step instruction you’ll see it’s a lot easier than you might think. Plus, it’s not snack time without some potato chips, with a couple other chip variations. And for the real snack-lovers out there, one lesson is devoted to stocking your pantry so that you’ll have the maximum of opportunities to whip up custom snacks with a minimum of effort, including a couple off-the-cuff snacks for which you don’t even need a recipe. If you’re quick, you can get your name in the hat to maybe WIN access to the class! The deadline is February 20 around 3:00 PST. Just click here to enter the drawing.